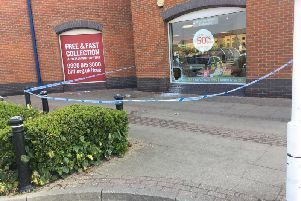 Thursday 10.20am: Masked men armed with a disc cutter and a crow bar got away with cash, cigarettes and alcohol following a terrifying armed robbery at a Parmwell shop on Tuesday. Police were called at 10.17pm on Tuesday (December 16) with reports of a robbery at the One Stop Shop in Parnwell Centre, Parnwell, Peterborough. The raid is reported to have taken place between 9.58pm and 10.17pm. Staff were preparing to close the store for the night when three masked men burst into the store. They were all wearing balaclavas and gloves. A Cambridgeshire police spokesman said: “Offenders had with them a red disc cutter, crowbars and a large builders’ rubble sack which they filled with cigarettes, alcohol and cash from the till. One man is described as being six foot, in his late 30s and wearing a grey jumper and tracksuit bottoms. Another is described as being stocky, six foot and wearing a black jumper, black zipped jacket and tracksuit bottoms. The third is described as slim about 5’2”, in his 20s and wearing a blue jumper with a long pocket across the front. Anyone who has any information should contact police on 101, or Crimestoppers, anonymously, on 0800 555 111.